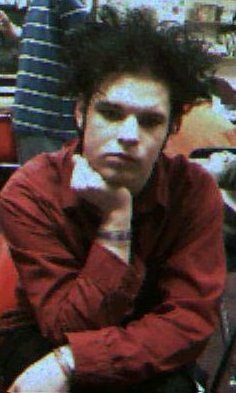 So the Cure concert is only four hours away, and you still have no idea how to get your hair big enough to outdo the other obsessive Cure fans and random goths. Here are a few tricks included in step-by-step instructions for making your hair rival even Fat Bob himself. At least 30 minutes, usually more. LIGHTLY spritz all of your hair with Rave and let it dry. Rave dries quickly, making it ideal for this hairstyle. Crimp your hair all over. * It takes time, but it really makes your hair bigger more easily. Tease/Rat all of your hair. To tease your hair, grab a small section and hold it up by the end. Comb downward with the teasing comb in short fast strokes until it gets tangled at the bottom. Re-spritz with Rave, more liberally than the first time, but still not heavily. While the hairspray is setting, pull the hair into the basic shape you want it to be. I usually don’t do much after this step, because it tends to turn out nicely. Re-spritz very lightly and blow-dry, with the dryer set on the gentlest setting possible. If it still moves your hair too much, hold it as far away from your head as you can. Spritz any weak sections of your hair with Rave, to make sure it won’t fall down in a few minutes. Close your eyes, hold your breath, and cover your hair with a good coating of AquaNet. Repeat this step until you think your hair is stiff enough to withstand the elements and toxic enough to choke a third world country. *A NOTE: You can use gel before you crimp it, but I’ve found it makes my hair less manageable and heavier, and thus more prone to falling. Your hair should look big, ratted, kinda pointy, and very ’80s. Austin Greene has had big hair for years.